The roots of the Finnish smoke sauna run deep. 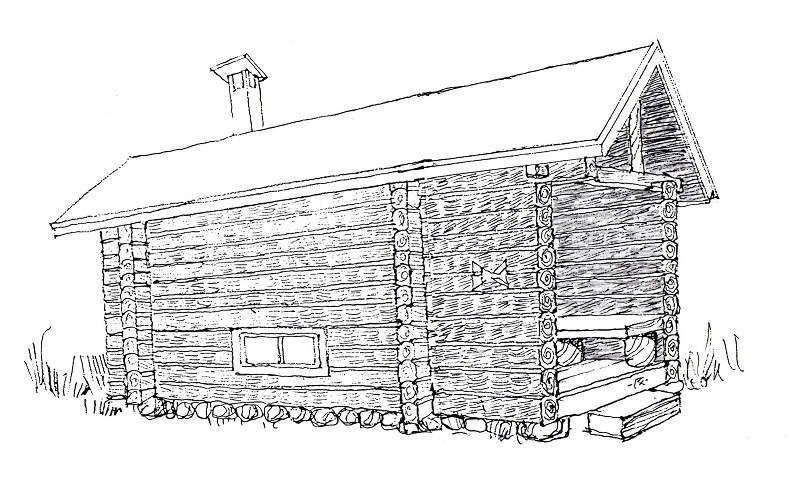 In the Finnish national epic, The Kalevala, smoke sauna was depicted as a source of strength and remedy. The dim light, smells, silence and the after-heat of the following morning of an authentic smoke sauna are magical. 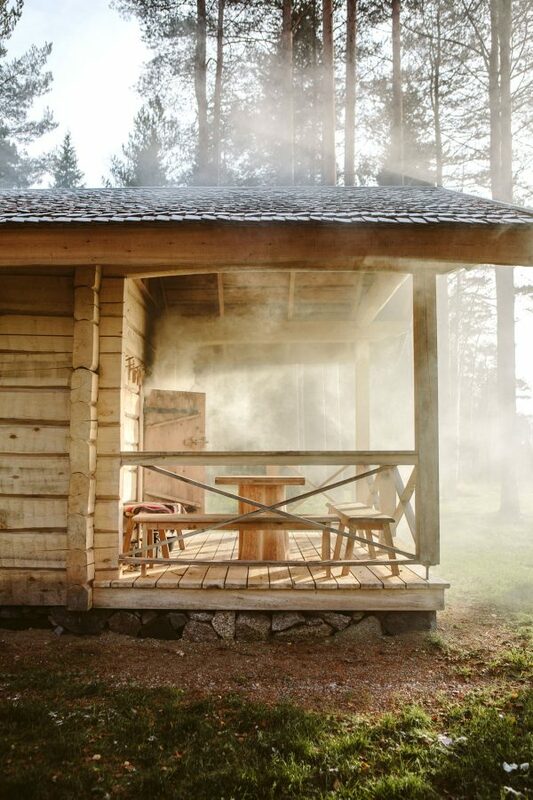 When you combine the design work of architect Risto Vuolle-Apiala, who has done his lifework with smoke saunas, and Hirsityö Heikkilä’s professional know-how in wood construction, the end result is a smoke sauna unlike any other built in the world. It is a traditional smoke sauna where bathing is a genuine and authentic experience. 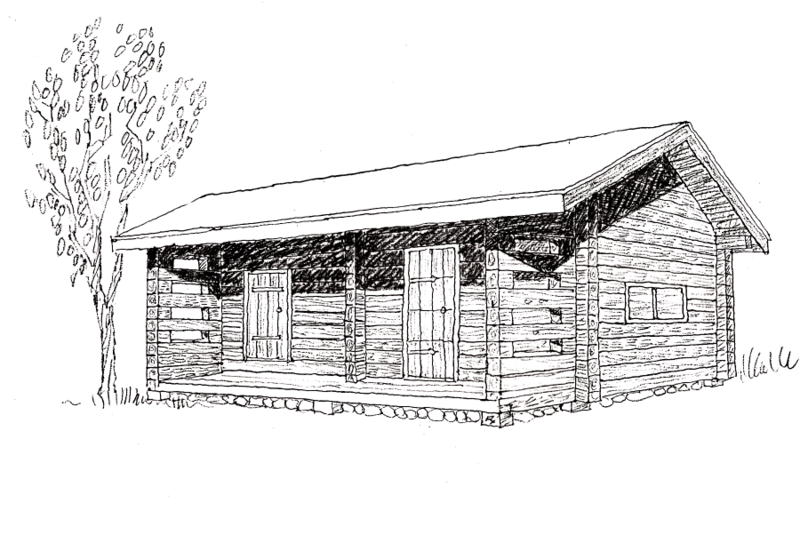 Jalmari is the largest smoke sauna cabin in our collection. 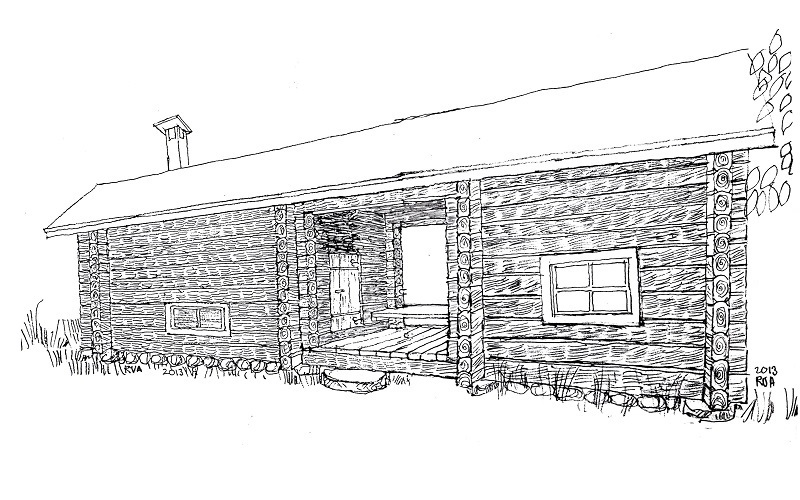 Like in all of our smoke saunas, it has a spacious sauna and washroom with Savonia-style benches. In addition, and unlike in our other sauna models, Jalmari has about nine-square-foot terrace leading to a separate lounge that is perfectly suitable for, for example, accommodation. The floor design of Kaarina is based on an old Ostrobothnian sauna building tradition where high, platform-like, benches are located on the rear wall. You can rest your feet on the wide bench during bathing. 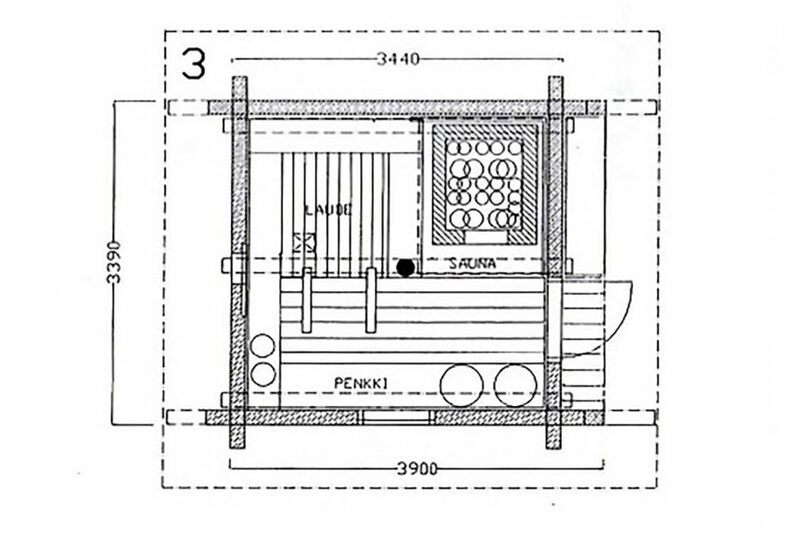 The washing bench, with water basins, is located on the window wall, opposite to the sauna stove. It is possible to place a heatable water pot next to the sauna stove for heating the water. The extended dressing room of Kaarina also enables accommodation. The space is big enough for two beds or bunk beds, a closet or small kitchenette and a four person dining table. The package also includes a roofed terrace in front of the sauna and a roofed storage slot for fire wood on the back wall. 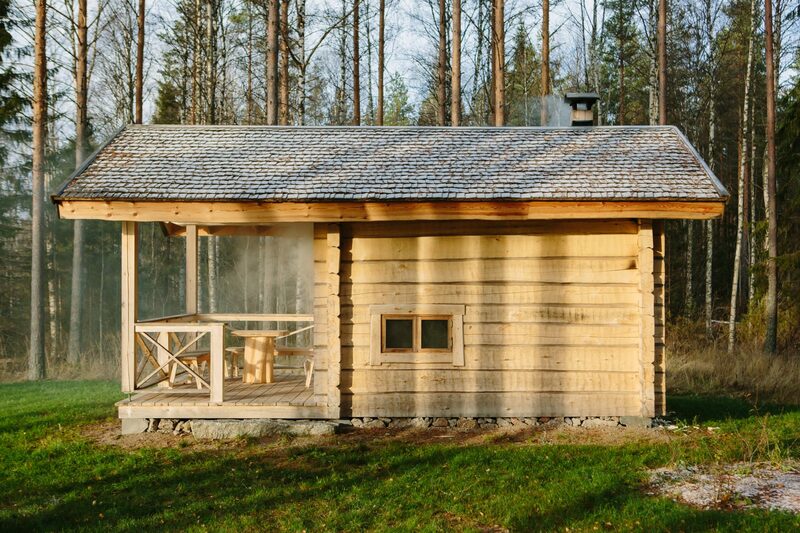 The walls of Kaarina are built from hand-carved log that is at least 150 millimetres thick. The visible surfaces are wave-carved. Outer surfaces are treated with nearly black tar-linseed oil paint Roslag mahogany or grey iron sulphate. The outer surfaces can also be left untreated when they will weather as years go by. Aune, that consists of a smoke sauna and a dressingroom/lounge, can be size-wise constructed in a traditional Ostrobothnian way as a smoke sauna with back wall benches. Aune also has a washing bench on the window wall, opposite to the sauna stove. The water is heated using iron buckets that are placed on the benches. 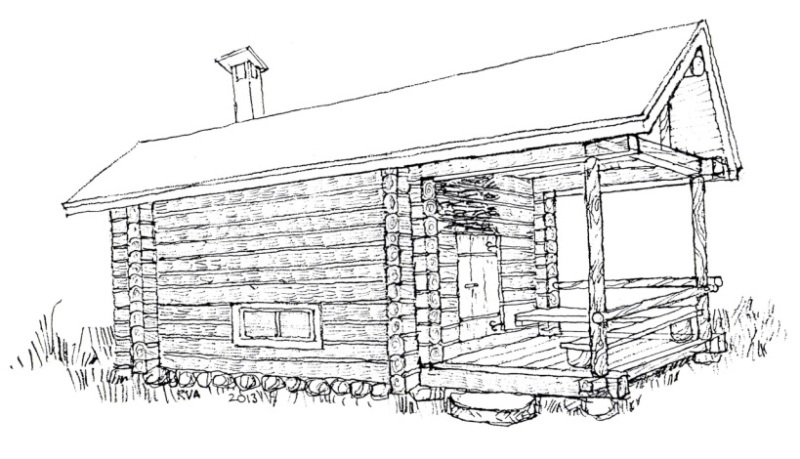 The log-walled dressing room is furnished with plank benches that skirt the walls, and on the wall, there is a row of pegs designed for hanging your clothes. A table placed in the middle of the room makes the space more comfortable. The foyer is enclosed which makes the sauna more comfortable to use during autumn and winter times. 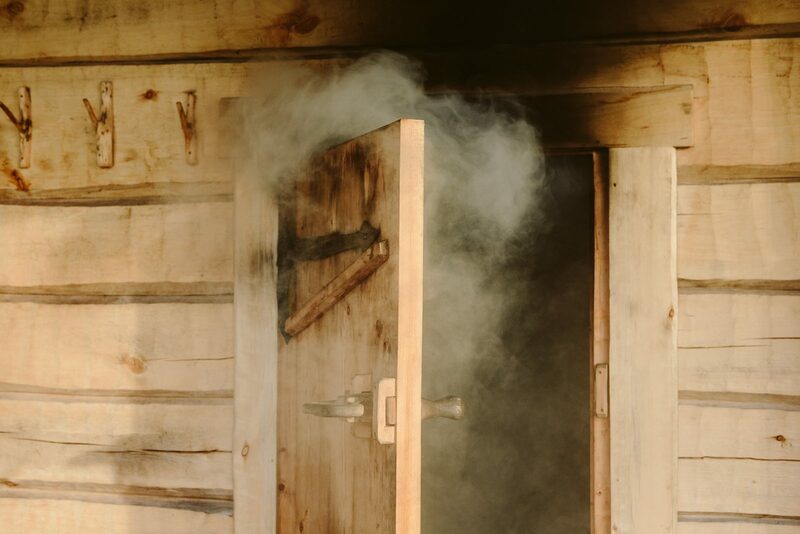 In Aune, some of the smoke caused by heating flows through the sauna door to the dressing room where it is conducted straight up to the roof with the help of a special plank horn. The outside surfaces of Aune can be treated the same way as Kaarina. Vilhelmi has plenty of bathing and washing space due to its special bench solution. Vilhelmi has a traditional Western Finland style back wall bench that is accessed by climbing up a set of stairs. This bench style enables building a larger sauna room. 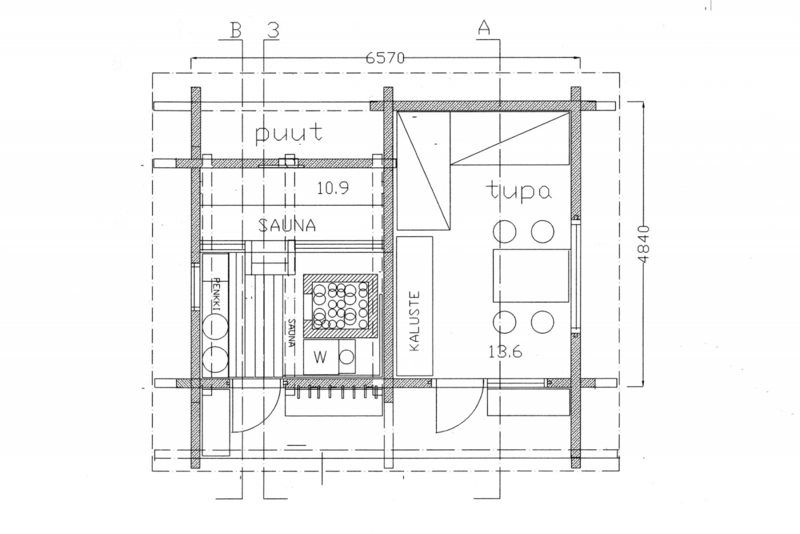 The sauna room in Vilhelmi is over 12 square meters and, like the Martti model, Vilhelmi has a spacious terrace. Space-wise the Martti model is like the big brother of Vihtori. Martti has the same size sauna room and the same benches as Vihtori. In addition, Martti has a terrace that can be used as a dressing room and cooling off space. The side walls of the terrace can be left open or they can be clad with, for example, waney-edge boards that complement the sauna’s overall style. Juho comes with a Savonia-style bench model. 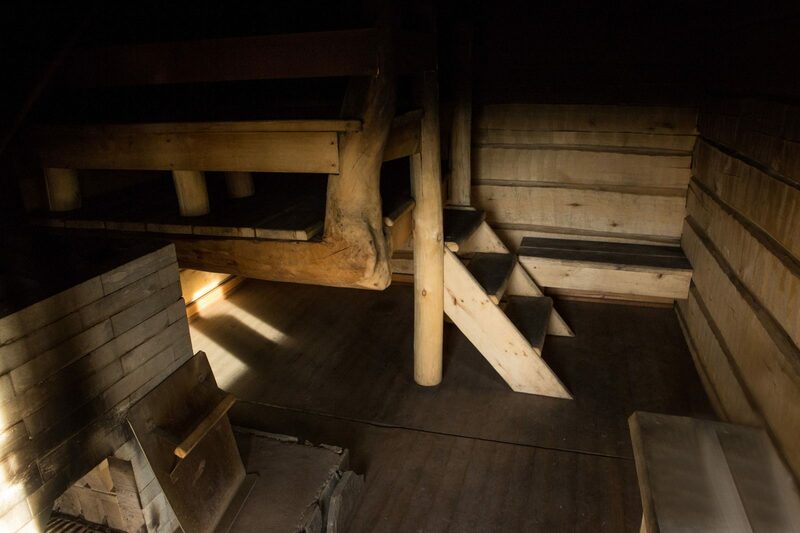 The size of the partially open dressing room in Juho is 3,4 meters x 1,5 meters and the side walls are log all the way up. Vihtori is the smallest sauna model in our collection. 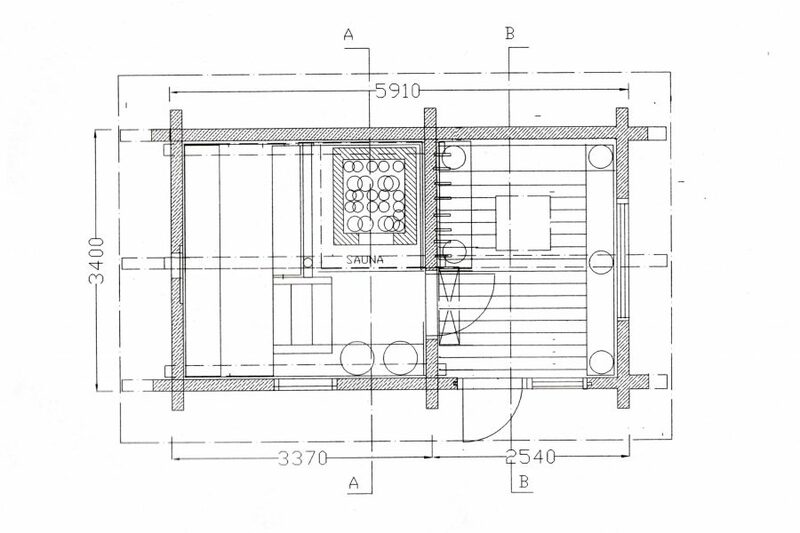 It is a traditional and minimalist smoke sauna that still works as a practical and functional bathing space. The Savonia-style ring bench in Vihtori is well-suited for communal bathing moments. 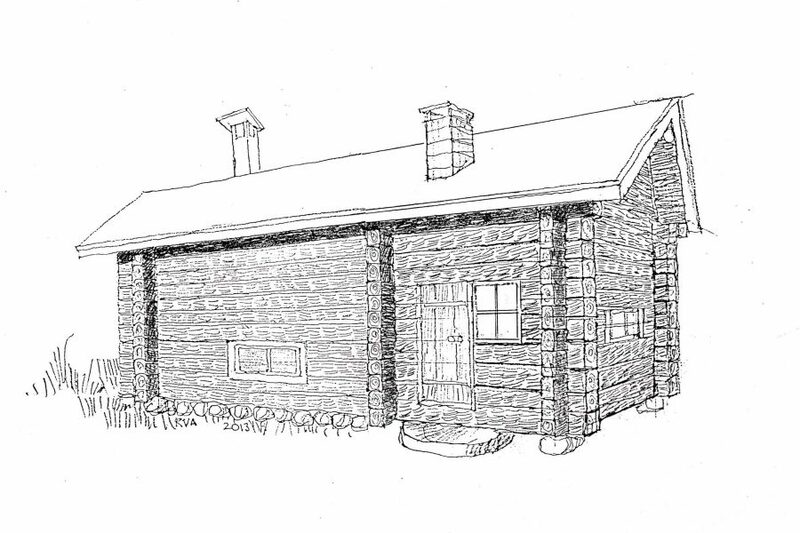 The extended roof of the front end provides a sheltered dressing space, so Vihtori works best in places where there is another dressing space nearby.